We will get into more intriguing facts later in the article. More points will be made about why so many people are starting to wonder if there is, or was, an alien presence on the moon. These points make it easier to consider the lore that surrounds the moon landing. Perhaps one of the most interesting points is what Neil Armstrong communicated to Houston when we landed on the moon. 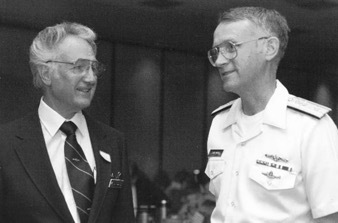 To the right you will see a picture of William Tompkins and Admiral Larry Marsh. As a teenager Tompkins had an eye for detail and loved to create Navy ship and submarine models. The Navy took interest in his capabilities and recruited him to do work on advanced technology projects. Recently, he has come forward with claims, as many others have, about clandestine Black Budget operation programs. The Landing Module (LEM) actually impacted the Moon surface in the Sea of Tranquility Crater, which had tremendous size vehicles parked around part of its rim. When astronaut Neil Armstrong made that First Step for Man on the Moon he looked up to the edge of the crater and said to mission control: “There are other ships here, they are enormous. The public did not hear that statement or see the massive alien starships. Armstrong panned his camera in a 360 degree motional all around the crater and the CIA then classified the information as way above top secret. He says that a former member of MI6 revealed her conversation with Neil Armstrong at a NASA conference, when he confirmed there were “other” spacecraft on the Moon when Apollo 11 landed in 1969. Armstrong also confirmed the CIA was behind the coverup. He also goes into more detail about it in this 2013 lecture. It’s not only agency astronauts, but agency insiders as well. For example, Dr. John Brandenburg, the Deputy Manager of the Clementine Mission to the Moon, which was part of a joint space project between the Ballistic Missile Defence Organization (BMDO) and NASA, has also made some fascinating revelations. The mission discovered water at the Moon’s poles in 1994 (Source: page 16 of 18)(source)(source). [The Clementine Mission was] a photo reconnaissance mission basically to check out if someone was building bases on the moon that we didn’t know about. Were they expanding they expanding them? . . . Of all the pictures I’ve seen from the moon that show possible structures, the most impressive is a picture of a miles wide recto-linear structure. This looked unmistakably artificial, and it shouldn’t be there. As somebody in the space defence community, I look on any such structure on the moon with great concern because it isn’t ours, there’s no way we could have built such a thing. It means someone else is up there. 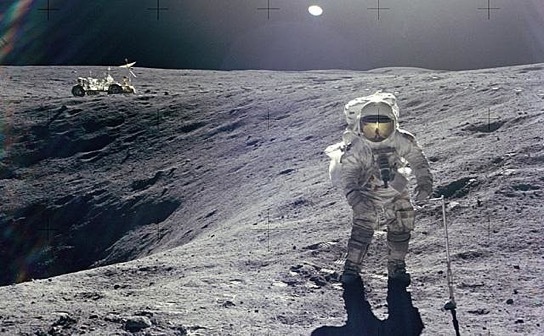 George Leonard, a NASA scientist and photo analyst, has obtained a number of official NASA photographs of the Moon, which he published in his book Somebody Else Is On The Moon. Although the photos are small and their resolution poor, they show details of original, massive prints. Far more compelling than these photos, then, are his verified NASA credentials and his statements about what was found on the Moon. 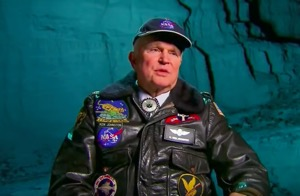 And he’s not the only one with a credible background trying to tell the world the truth about the Moon and the photos that were taken from the Apollo missions. Dr. Norman Bergrun, a mechanical engineer who worked for Ames Research Laboratory, NACA (National Advisory Committee for Aeronautics), and Lockheed Missiles and Space Company, now known as Lockheed Martin, has accused the agency of “garbling” photos the agency does not want the public to see. He has also stated there are a number of large UFOs out there. You can view some of his publications for NASA, where he worked for more than a decade, here, and watch that interview here. He is one of hundreds of military whistleblowers to give some very interesting testimony. Contrary to popular belief, reports of artificial structures on the moon are both common and persistent. Among the first were from George Leonard’s 1976 book, Somebody Else is on the Moon, and Fred Steckling’s 1981 book, We Discovered Alien Bases on The Moon.